DeerTech, A SavATree Company, launches the next generation of ultrasound devices to deter deer browsing on landscape plantings. Called the 2020s, the new ultrasound units draw on over a decade of research, field evaluations, testing and the latest technological advancements. 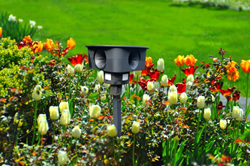 Deer deterrence was improved by 64% over the previous devices to more effectively protect landscape plantings and keep them looking their best year round. “We are excited to offer our clients this improved technology which is less obtrusive in the landscape yet more powerful against deer damage. Our goal is to give clients the ability to plant a wide variety of flowers, shrubs and trees in the landscape and not have them destroyed by deer,” stated Sabrina Albrecht, DeerTech Program Assistant Director. The devices are utilized as part of DeerTech’s patented Three-Circles of Protection program which has a unique value proposition for clients. The Three Circles are Sound, Treat, and Switch, which provides far more protection than any single device or treatment on the market.